Clean water should be a right, not a fight! But with a Governor’s office that’s been up for sale to corporate agribusiness and big polluters, Iowans can’t take the quality of our water for granted anymore. Our governor and legislature have refused to address the deteriorating quality of our state’s rivers, streams, and lakes for years. We need a Governor who is committed to putting our people, our planet, our quality of life, and our water above profits! That’s why Iowa CCI Action endorses Cathy Glasson for Governor! She’s saying what our members say — no more factory farms! Big ag gets the profits; local residents get the pollution. Runoff from the current corporate ag-style of farming dumps a toxic mix of pesticide, manure, and chemical fertilizers on to the land and into Iowa’s waterways and soil. We’re endangering our environment for generations to come. force the corporate polluters who are fouling our water to clean it up. demand a moratorium on new or expanding factory farms until water quality in Iowa improves significantly. push for local control, tougher rules and regulations, and stronger enforcement to crack down on factory farms. Cathy signed a pledge not to take a penny in campaign contributions from the oil, gas and coal industries. And, she won’t take any money from the factory farms either. We need a Governor who isn’t bought and paid for by the polluters. BUT we also need a Governor who will stand with the people and push the bold solutions we need. Cathy knows that as governor she can’t do it alone. She’s using her campaign to build a strong people-powered movement to pressure legislators to move on this important issue. 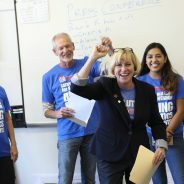 If you care about clean water in Iowa, there is one clear choice for Governor: Cathy Glasson. Are you with Cathy and the clean water fight? Yes, I’m supporting Cathy for governor! I support this issue but I need more information on the candidate. No, I’m supporting another candidate. P.S. The Des Moines Register called Cathy’s campaign “an emerging dark horse” in the race. We know it! We’ve been filling rooms across the state with new supporters. We’re fighting for Cathy. And when we fight, we win. Let us know you’re in!